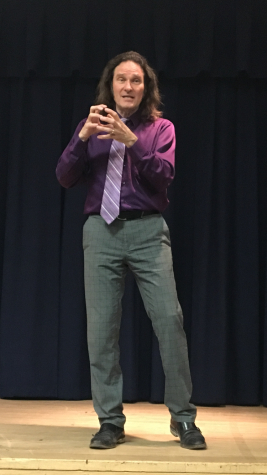 Expert storyteller Jonathan Kruk shared the infamous tale of Washington Irving and The Legend of Sleepy Hollow at the School of Liberal Arts’ Time themed event. Photo taken by C. Caiati. Students gathered in the Lecture Hall on March 1, ready to be guided into 19th century Westchester by Kruk, an expert actor, storyteller, and historian. Kruk, hailed as the “best storyteller in the Hudson Valley,” has made a successful career out of his stories that blend history and tall-tales to create enchanting images of times long-gone. Having grown up in Westchester, the history and magic of the Hudson Valley is a topic that he often shares with his listeners of all ages. Kruk spent his time on the Lecture Hall stage painting a colorful picture of Washington Irving and the many inspirations the Hudson River Valley brought Irving as a rising author. Kruk graced the stage, acting out the folklore and ghost stories that inspired Irving to create the iconic characters in the world-famous short story “The Legend of Sleepy Hollow”. Storyteller Jonathan Kruk takes to the Lecture Hall stage to send us on a journey back in time. While Kruk performed, the audience could feel his passion and excitement to share the wonder of “The Legend.” He told of Irving’s loss of his true love Matilda. During his time of suffering, he discovered German fairy tales that helped heal the wound of his heartache. Irving began collecting these stories, and even writing his own, being intrigued by tales of a headless horseman told to him by a runaway slave, the mystery of Dutch women, and the battles that happened in the area, among other things. Kruk tailors his tales to perform for audiences of all ages, from preschoolers to adults. He shares that it’s fulfilling for him to be able to perform for college students, because he can go into more glorious detail about the connections the content has within history. “I enjoy having the opportunity to delve into things with a more sophisticated crowd,” he says. That doesn’t mean, though, that his performances differ vastly across the demographics. He states that the feelings he brings to any crowd should have them going home with a sense of enchantment. “There’s an element that’s always the same. I look out and see people wanting to know something interesting, so it stirs inside of me a desire to find a way by hook or crook, or by imagination, to bring out the best in the story,” he says. “I want the audience to feel lifted out of regular life the way a good fairytale begins with “once upon a time” and ends with “happily ever after”. You have between those two phrases, this beautiful space to listen, imagine, and go on a quest,” Kruk shares. Jonathan Kruk and members of the School of Liberal Arts committee pose for a picture after the event. Irving compiled many of these inspired tales, including “The Legend of Sleepy Hollow”, the first American story to “go viral”, to be published within in a series of 11 other books. Irving paved the way for other early American writers to share their stories with the world. Which is exactly what Kruk inspires others to do every time he steps in front of an audience. His advice to aspiring creators is to work with their own self doubt, and to let themselves share what they love with the world. During his storytelling, Kruk goes into detail about the influences on Irving’s writing and the cultural and historical context in which his stories were written, creating a performance that spans the disciplines of history, literature, art, and human nature. This intertwining of disciplines is what makes the School of Liberal Arts’ “Time” events so worthwhile. Dr. Fazioli, Assistant Professor in Dept. of Humanities, has a key role as a chair on the committee making these events happen. Every year, the School of Liberal Arts chooses an annual theme and hosts events throughout the year that center around the ideas brought about by the chosen topic. “Dean Tamara Jhashi wanted to come up with some more activities and events in The School of Liberal Arts to bring people together outside the classroom,” Fazioli states. These events encourage students and faculty to build a better sense of community and come together to share interests across all disciplines. This year’s theme of “Time” is a broad concept that can be spread across different disciplines, and the goal of the School of Liberal Arts is to get students of many different majors and personal interests to be able to attend. Dr. Fazioli pictured in his office alongside posters from past “Borders” and “Time” Liberal Arts events. “One of the reasons we do this is because we think intellectual discussion should happen outside the classroom; it shouldn’t just be something you’re forced to do because your professor makes you do it. It should be something that could come naturally, and could actually be fun,” Fazioli says. “It’s something that I think is genre-bending and interdisciplinary, and unique,” Fazioli shares. Other events planned this year are an Open Mic where students are encouraged to share personal narratives and songs that relate to current historic events and social issues within their lives. A talk with a former prisoner who was involved in theater during his sentence will be coming to campus to share his story at an event at the beginning of April. Finally, there will be a lecture by a CUNY graduate student about the philosophy of time travel. These events are open to all students and faculty at Mercy College, and are also open to the public, encouraging surrounding communities to get involved. For more information about upcoming events in the School of Liberal Arts, visit https://www.mercy.edu/liberal-arts/. To learn more about Storyteller Jonathan Kruk, visit his website at https://www.jonathankruk.com/.